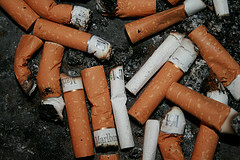 A current study has shown that smokers are at a greater risk of developing throat and stomach cancer. The study also mentioned that smokers who quit years ago are still at risk. Italian researchers studied 33 different and independent studies and concluded that smokers have twice the likelihood of developing esophageal and stomach cancer than those who never smoked in their lifetime. Smoking has already been noted to increase the risks of developing throat and stomach cancer for years. Even more disturbing is the fact that the risks remain even after you quit smoking. However, they pointed out that quitting this vice is still highly beneficial. Both types of cancer are not common in the Western part of the world as they are more prevalent in third-world or developing countries. In the recent years, however, occurrence of these cancers has increased in Europe and the United States. Studies show that there is only one out of 200 chances that an average American will develop esophageal cancer, and one in 114 chance of having stomach cancer. That means if you are an American who has never smoked in their lifetime. It is also further noted that these kinds of studies do not prove that smoking can directly cause esophageal and stomach cancer. To prove that, researchers have to intentionally expose their subjects to tobacco smoke and that can be questioned from the ethical stand-point. However, Dr. Eva Negri, head researcher, insisted that the study still gives smokers one more good reason to quit and those who do not, to never start smoking.